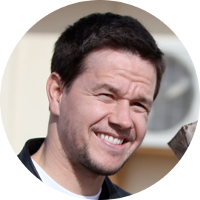 Mark Wahlberg is an American actor and producer whose first claim to fame was in the music business as the rapper Marky Mark. He's appeared in a number of films since the 1990s and has more recently served as executive producer of a number of HBO television series including Boardwalk Empire. He is also the co-owner of the Wahlburgers restaurant chain with his brothers and stars in a reality TV series about it. He was nominated for both an Academy Award and a Golden Globe for his performance in the film The Departed. Some of the television series that he co-produced have also been nominated for Emmy Awards. Mark Wahlberg has a family connection to a number of U.S. Presidents and First Ladies. His presidential kin include John Quincy Adams, Herbert Hoover, Calvin Coolidge, Millard Fillmore, Franklin Pierce, Grover Cleveland, William Howard Taft, Richard Nixon, Gerald Ford, and both presidents Bush. His kinship to U.S. First Ladies includes Abigail Adams and Barbara Bush. In addition to his brother Donnie Wahlberg, Mark Wahlberg has a number of fellow musicians and Hollywood celebrities in his family tree. These include Walt Disney, Kyra Sedgwick, Halle Berry, Shirley Temple, Matt Damon, Ben Affleck, Grace Slick, Raquel Welch, and Madonna.